These exceptional antique George V English sterling silver candlesticks have a plain circular form in the classic Arts and Crafts style. The plain hallmarked bell shaped capital to each candlestick surmounts a circular rounded drip pan embellished with embossed rivet style decoration to the rim; this ornamentation is visible to the anterior and posterior surface. The capitals feature a protruding spike to the interior, enabling a candlestick to stand securely in situ. The capitals are supported by plain cylindrical tapering columns embellished with a broad band of rivet decoration to the lower portion. The circular spreading base is encircled with a rivet style decorated border. The bases of these impressive candlesticks are weighted, as to be expected, and are fitted with green baize to the underside. These antique silver candlesticks were crafted by the renowned silversmiths James Dixon & Sons in a very unusual style; a square version was more commonly constructed by this maker. 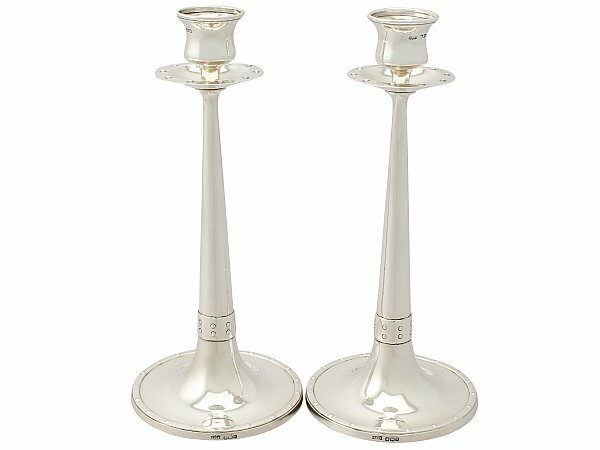 These antique silver candlesticks are a very good gauge of silver, excellent quality and in excellent condition. Full hallmarks struck to the surface of the rim of each base, and part hallmarks to each capital are all very clear. 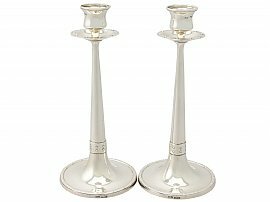 Diameter of drip pan 5.8cm/2.3"
An accurate weight of silver cannot be provided as these candlesticks have weighted bases.